An All-inclusive extreme adventure package and dolphin interaction program! What does this package for Xplor Park include? Free transportation: hotel – Delphinus Riviera Maya Xplor and back to the hotel. 2 zip-line circuits (7 lines each). 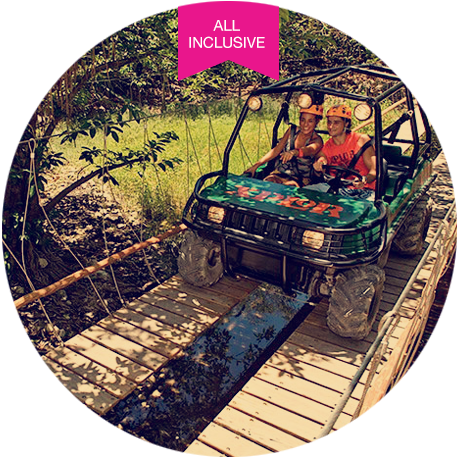 Drive an amphibious vehicle in the jungle. Enjoy unlimited food and beverages. This package is only offered to people staying in hotels on the Riviera Maya. Available from Monday to Saturday from 08:30 am to 5:00 pm. The recommended minimum age for Xplor is 5 years old. The minimum height required for the zip-line activity is 1.40 mt. Bring your swimsuit for the dolphin interaction program. It is allowed to take photos in Xplor, however, for safety reasons participants are asked not to bring video or photography cameras to the wet areas around the dolphinariums in Delphinus. This offer is sold as a package. All park activities and interactions with dolphins must be used on the same day. Accompanying members must pay for the full tour. You must reach the delphinarium and Xplor Park in Delphinus transportation or else you will not be given access. The activities are not suitable for pregnant women and people suffering from diabetes, heart problems, epilepsy, asthma, hypertension and claustrophobia.